Australia has forged egalitarian sentiments largely because, in its founding era, the authorities were obsessive in depriving Convicts and their descendants of it. The Convict system ensured that people in positions of superiority were rarely representative of the material and spiritual aspirations of the criminal class that constituted the bulk of the population. A census taken in 1828 found that half the population of NSW were Convicts, and that former Convicts made up nearly half of the free population. Yet despite being in numerical dominance, the Convict class was unable to aspire to civic positions that were reserved for the Exclusives (immigrants not of Convict stock.) The Exclusives argued against the Convict class gaining equal rights on the grounds it would be 'rewarding criminality.' The denial of equality was also extended to the Convict offspring on the grounds the child of a Convict would show 'the same proclivity to crime as their parents had deemed to have shown'. As well as being excluded from holding official positions, the Convict class was discriminated against in the distribution of land grants. Whereas free immigrants were frequently given grants running in thousands of acres, Convicts were only granted forty acres whilst the native born of Convict stock were only allowed sixty acres. “Men betraying their companions or accepting authority over them, are often called "dogs", and sometimes have their noses bitten off- the morsel being termed "a mouthful of a dog's nose." "He declared, confidently, that an immense number of women were dying for his diminutive highness, but became terribly angry, when an ugly, red-nosed publican with a hump-back, pretended to recognize him as an organ grinder strolling about with a monkey." "Historically, the greatest rift has been between the "exclusives" and the "emancipists". The first group believe that anyone who has come to the colony in penal servitude is never capable of complete redemption. These people, who tend to be among the wealthy landowners, thus see themselves as a superior class. For their part, the emancipists, who are all ex-convicts, are concerned with equality of human rights." " They had been taught by their parents, or had otherwise acquired, a strong dislike of the speech, manners and attitudes of the higher British classes. It was possibly the latter's nonchalant sense of superiority, combined with a lack of sensitivity to the suffering of the troops, that infuriated the ANZACS most. " "Australians love an underdog. We love people who are humble, down to earth, almost embarrassed by their own successes. We love Ian Thorpe, who is not only a decent young man, but who can just get on with the job without all the pomp and ceremony that Americans love to employ. We love Susie O'Neil, sweet, quiet, hard-working. Michael Diamond - could you possibly see a more humble person than this? Australia became an egalitarian society because people who were treated as second class citizens refused to accept that they were in any way inferior. This refusal to accept inferiority greatly differentiates Australia from its eastern hemisphere neighbours, where heirachial thinking prevails. Different Australians have tried to alleviate the feelings of inferiority in different ways. In sport, some Australians have taken the difficult option of trying to improve themselves. As a consequence of their attitude, Australia has more per capita achievement in sport than any other nation. In the arts, many Australians have taken the creative option to avoid feelings of inferiority. By refusing to conform, comparisons of quality are difficult to make, as are rankings of quality. In other words, they have embraced the idea "not better nor worse, just different." As a consequence, Australia has become a very creative country, but not a country with much refinement or common styles. In social life, some Australians have taken the bigoted option. By criticising others, they have been able to make themselves feel a greater sense of self worth. The targets of the bigotry are usually those who make the individual feel inferior in status. Specifically, beautiful women, wealthy businessmen, people with talent. Even though many Australians refuse to accept inferiority, only a few have a strong desire to exhibit signs of superiority. Perhaps this is because exhibiting signs of superiority would result in the individual becoming a target of criticism. As a consequence, Australians are renowned for downplaying their achievements. The Australian version of English is quite unique in that there is no socio-economic variance in pronunciation, as is the case in Britain. For example, the late billionaire Kerry Packer was born with a silver spoon in his mouth and was sent to Australia’s finest private schools, but he ended up speaking with the same accent as an Australian tradesman. Likewise, ex-prime minister Bob Hawke was born into a life of privilege, but again ended up speaking with the same accent as tradesmen. In England; however, it would be unthinkable to have a prime minister or media magnate speaking with the same cockney accent as the lower class English. Located in an alley in the middle of Melbourne's CBD, Section 8 uses packing crates as seats. The toilets are made out of shipping containers and the bar is just enclosed with a fence. Section 8 attracts rich businessmen, Japanese tourists, struggling artists and even homeless people. It is deliberately designed to be unpretentious. As a result, it used to attract people from all walks of life that wanted to mingle with someone different from themselves on an equal level. In recent years; however, policy has changed to exclude business people. 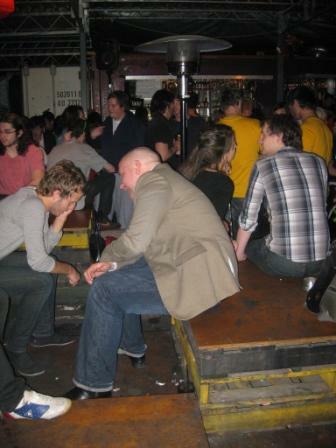 It is now a bar where patrons may be requested to remove their tie or jacket before entering. In most Asian countries, if a group of friends go out for dinner, the wealthiest member of a dining party may offer to pay for the entire meal. Furthermore, if a man and woman go to dinner, irrespective of whether they are friends or lovers, the man will usually pay. This is not the case in Australia. If a group of friends go to a restaurant, the bill will be split amongst all the diners. It is unlikely that one individual will feel an obligation to pay for others. Nor do any of the other members of the dining party want to be paid for. To accept the generosity may evoke feelings of shame that one is a bludger or somehow less worthy that they need to be paid for. By paying their own way, the poor members are not inferior in status and rich members can't show their superiority. In both team and individual sports, Australia is arguably the world’s most successful sporting nation. Per capita, Australia has won more Olympic gold medals than any other nation. In team sports such as rugby union, netball, rugby league and cricket, Australia is one of the world's leading nations despite drawing its talent from a very small population which plays a huge range of sports. One of the secrets to Australia’s success is a reluctance of individuals to defer to people who are superior in ability. Instead of accepting their inferiority when confronted by someone of superior ability, the individual Australian will usually train hard with the intention of giving a good contest. This in turn lifts the overall standard. As well as being seen on the field, it is also seen in the stands. In Australia, fans usually support the underdog over the top dog. By supporting the underdog, the fans are demonstrating that they lack appreciation for the top dog’s abilities and want the top dog knocked off. This further encourages the underdogs on the field to believe in themselves and not accept their inferiority. Individuals who play Australian sport are indoctrinated into a culture that demands people pull themselves up if knocked down. It also demands that they never be content with inferiority. The top dog is always fair game. History has proved that it is a culture that produces champions. Even though Australia is one of the world’s most successful sporting nations, Australia has produced a sub-culture that takes no pride in Australia’s sporting achievement. In fact, this subculture is outright hostile to sport and any media coverage of sport. Arguably, no other country has such a vocal subculture attacking sport. Ironically, countries such as Brazil, India, China, Britain and Japan have a broader fascination with sport than has Australia, even though they have achieved less. Furthermore, many indigenous cultures see both the arts and the sports as necessary to make a complete individual. Perhaps the dislike of sport stems from a fear of sport's competitive environment that results in different individuals being ranked in ability. Some Australians react to the feelings of inferiority by trying to improve themselves. Others react by becoming hostile to the whole competitive system. In addition to personally disliking sport, the concerned citizens dislike the fact that other Australians are more interested in sport than their own interests. The relative popularity of sport over their own interests makes them feel as if their interests are somewhat unworthy. To deal with their feelings of inferiority, they may attack sport. Exactly what the tall-poppy syndrome refers to has been a subject of debate. What can’t be debated is that anyone who seems to demonstrate that they are superior to others will probably be attacked. For example, someone who drives a Mercedes to show their wealth will probably find that their car frequently gets scratched. Someone who boasts about their achievements will frequently find themselves subjected to cynical or sarcastic remarks. Any politician that tries to portray themselves as more moral than others will find people on the lookout for skeletons in their closet. The Landlord, by Convict artist W.B Gould, shows an early expression of Australian egalitarianism. It depicts a suited man with a toothless grin. Strict convention amongst noble man of the time was a deadpan expression; especially if one's teeth were missing. Without doubt, Gould had painted an ex-convict whose desire to conform to social prestige had been surpassed by a self-effacing personality. "striving for mediocrity in a world of excellence". Because The Chaser team attended the best private schools of Sydney, they have an elitist background that would alienate them from much of the Australian audience. However, by portraying themselves as losers they are able to somewhat escape their heritage. Many Australians have quite an odd attitude to patriotism. On one hand, they can be very scathing of their country. In front of an international audience, they will criticize their country without any real sense of personal shame that they come from the country they are criticizing. It is almost as if they are afraid the international audience will think that Australia is superior in any way so they need to cut their own country down to avoid being accused of supremacist thinking. "I remember there were a few years when Australian films didn’t do so well at the box office and it was assumed we hadn’t made good films. We did make good films but either they were marketed badly or they were just a bit too challenging for audiences to engage with." The "challenging" thinking has been thinking that equates Australian culture with racism, ignorance, sexism, homophobia and crassness. As is to be expected, the movies proved to be commercial flops in Australia and abroad. It just never seemed to click in the minds of the movie makers that they they were a product of the culture they were criticizing. If Australia was racist, then they would probably be racist as well or at the very least, outsiders would view them as racist and not be interested in what they have to say. Afterall, who wants to hear anything a racist artist from a racist culture has to say? Likewise, who wants to watch negative movies that have about the same emotional resonance as watching flies landing on a turd? Even though they have been scathing of Australia and their movies have not been successful, the movie makers have not been looking to America, Japan, France or Italy to learn how to make a blockbuster movie or a critically acclaimed arthouse movie. To look abroad would imply some kind of inferiority with Australia’s movie culture, which would be an admission they don’t want to make. Instead, they just blame the general public or critics for not being able to appreciate quality. Ironically, this gives them the very impression of elitism that made them fearful of celebrating Australia in the first place. In a nutshell, because they are afraid of the supremacist connotations of patriotism, they become critical of their culture, but then become even more critical of their culture when a lack of patriotism results in their culture not supporting them. It is egalitarianism gone made. The urban design of Canberra, the capital of Australia, shows even stronger egalitarian sentiments than cities designed by communist regimes. One of the most salient features of the design is the preservation of prime real-estate for public use. Instead of selling off the tops of hills or water frontage to developers, the land has been reserved for public access or for car parks. As a consequence, Canberra does not have the class concious culture that is associated with cities such as Sydney where prime real-estate has been sold to developers. Egalitarian sentiments are further expressed in the design of Parliament House. 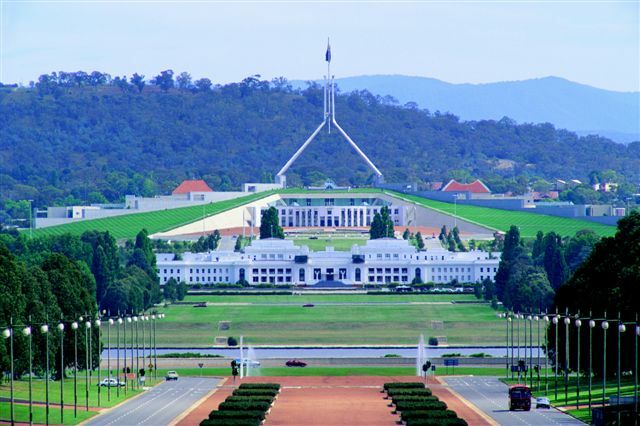 Instead of expressing domineering symbolism, Parliament House was designed to reflect the Australian national spirit by expressing that the community is more powerful than the government. Wide lawn arches rise over the building to allow the people to climb on top of their government, thus symbolising their power over it. Canberra's water frontage and hill tops have been reserved for public use. Ironically, the public just doesn't use them. Wide lawns also rise over the top of Parliament House to give the public the chance to symbolically express their power over government. Again, few members of the public bother to walk up the grass. Perhaps if a barbeque had been built on top then more Australians might have made the climb. What if Einstein had been born in Australia? Self-categorization Theory (Turner, Hogg, Oakes, Reicher & Wetherell, 1987) explained Einstein's predictions by saying individuals will make salient a social identity that allows them to be associated with success or distanced from failure. In this way, if the individual is short of esteem on an individual level, he or she can attain some esteem on a social level, which compensates for his or her individual failings. This begs the question, if Einstein had been born in Australia, would the words "Australian" and "New Zealander" have been substituted for German and French? The answer is probably no. Social esteem is problematic for Australians because there are few strong social identities that individuals can acceptably associate themselves with. In fact, in the eyes of many Australians, simply adopting a social position is a sign of failure on an individual level. The reasoning goes that although you wave a pretty flag, you are still personally a loser. The wide-spread ridicule of a social position forces the individual Australian to use individualistic methods to deal with feelings of inferiority. Consequently, if Einstein had been born in Australia, perhaps some scientists would have worked hard to try to be smarter than him or to produce even better theories. Other scientists would have dismissed the value of physics and studied astronomy instead. Some scientists would have looked for flaws in Einstein as a person, and criticised those flaws in order to reduce any prestige associated with Einstein. Some scientists might have tried to keep him out of their universities by hiring scientists from “disadvantaged” backgrounds in the name of equity. Overall, Einstein probably would have found himself in the same position that almost all of Australia’s great inventors and noble prize winning scientists have found themselves in. Specifically, he would have been publicly ignored.